Matchroom Sport have a lot invested in Britain’s London 2012 Olympic gold medalist Anthony Joshua (13-0, 13ko). The Watford born fighter has been embarking on the familiar career arc taken by nearly all young prospects, steadily increasing his level of opposition as the world waits to find out if he is indeed the real deal. Joshua boxes Scotland’s Gary Cornish on September 12th in a fight many are viewing already as a foregone conclusion, including it would seem, Sky Sports, who have an exclusive broadcasting deal with Joshua’s promoters at Matchroom and have today published AJ’s assessment of the rival heavyweight big guns, including Wladimir Klitschko, Tyson Fury, Deontay Wilder and, ahead of their fight, Cornish himself. “He has mental and physical strengths. Mentally, because he’s undefeated, he’s strong but also he has his size. He’s 6’8” and 18 stone which is dangerous in itself. Cornish fight aside, one would think, even for all his potential and natural talent, Sky are hyping him a little too much, too soon, given he’s yet to even take a clean shot on the button? Organisations like the WBC haven’t helped much either, increasing expectation by elevating him to a lofty #2 in their rankings despite his best win being against a Kevin Johnson who arguably turned up only for the money. 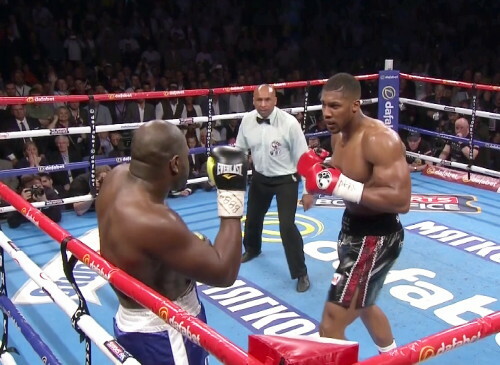 However should Joshua beat Cornish, he still then has the task of beating Brixton rival Dillian Whyte for the British heavyweight title at the end of the year in a potentially mouth-watering domestic tussle one hopes Eddie Hearn won’t go back on his word in making. There is a sneaking suspicion that “Fast Car” won’t be able to help himself from leaving it to marinate and thus “sell more” – especially now he has Dillian boxing on his shows, and cruicially for the first time in a long time, back on Sky Sports. The obvious weak link in the heavyweight division is the only other fighter outside of Klitschko to hold a world belt. WBC champion Deontay Wilder, and there is a belief among many that Joshua could beat Wilder tomorrow, given – for want of a better phrase – Wilder knocked over 30 odd tomato cans before a career best showing vs Bermane Stiverne to win him his title. His opposition, B-Ware aside, hasn’t exactly been any better than Joshua’s own, just served up more frequently. “He put on a 12-round clinic to win the title but I don’t look at that and think ‘that’s what I need to do’. Everyone said he couldn’t go 12 rounds but then he did, so I admire him proving people wrong. “He’s going to continue doing really well. I liked seeing him become the first American heavyweight champion in years. It changes the dynamic of boxing. “It’s been eastern European champions for a long time but I like what Deontay has done for America. The boxing scene is lifting out there and that’s a good thing. Deontay becoming champion, at this specific time, has helped. “What makes Fury dangerous is his Irish blood. He has the heritage of a fighting man,” AJ said. “It’s a shame that, in boxing, there’s so much negative energy. That’s why I admire Klitschko – because he’s at the highest level but he’s respectful. I take my hat off to him. “He knew who I was, and invited me to his gym. He needed sparring and we helped each other. “Remember, he’s an Olympic champion so he’s got the pedigree. He’s got this style where the sweet science of boxing is down to a tee. He knows how to win rounds, and over 12 rounds, he breaks opponents down.